Like clockwork, September rolls around and I am baking bread again. I know that most of September is still summer and September days can be some of the hottest, but for some reason this is the month I start to get back into baking, cozier foods and basically all the things I love about fall. I am not ready to switch full on into fall (even though my weather up in the mountains has been fall-like for the past few weeks), but I figured some bread would be a good way to ease into fall-like things. Slow and steady – promise, no pumpkin for a while! Plus, I really love baking bread… and the smells that come from the oven while baking. Nothing cozier, especially on a rainy, cold Sunday. I know it’s Tuesday, but I was baking this on Sunday and it was perfect. So I know I am calling this “breakfast” bread, but it’s really a bread you can eat at any time. Use it for sandwiches (avocado + blue cheese please! ), bake it fresh for dinner (and slather with buttah!) 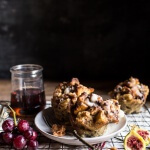 or slather it with butter and jam for breakfast… or some smashed avocado + jam. They are all delicious options. Around here though, this is refereed to as “breakfast bread”. Here’s the thing, bread is a big deal in my house. Ever since I can remember, we have always been a bread family. This is mostly because my mom loves bread. Well, really carbs of any kind and clearly she passed this trait on… to all seven of her kids. My dad loves good bread too, but not like my mom. Ever since I can remember my mom has always eaten the same breakfast. Hot chocolate and toast. Actually, when I was younger, I think it was pumpernickel bagels, but at some point she switched to whole grain toast. Not white bread or anything like that, but really good whole grain, hearty toast. I like it with my dad’s fried eggs on the weekends, Asher eats it pretty much every morning (for snack, after school and a lot of times at dinner too) and come to think of it, so does my older brother Brendan. But at some point, Asher started calling it “breakfast bread” and the name just stuck. I have to say, I have never seen a little kid eat so much whole grain bread in my life. You guys, I am telling you she lives off breakfast bread (and buttered noodles). While the bread we buy is ok, but it’s nothing like fresh baked bread. 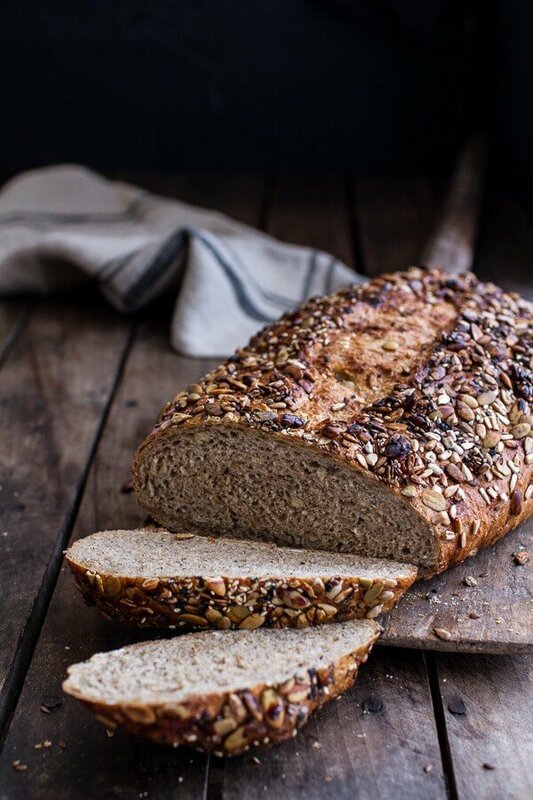 I really wanted to create a whole grain loaf that was light and crusty, but full of all the healthy things. I have actually tried so many times to achieve a bread similar to the one my mom buys from the store, but never had great results. So I kind of gave up for a while, but then September hit and I craved some fresh baked bread. I had baked a lot of bread last fall and picked up on a few tricks, so I gave those tricks a try and umm, hello!?! They totally worked and this bread is the best “breakfast bread” ever. No really, ever! I truly think the secret is baking the bread in a dutch oven. I know I said this last year when I was telling you guys about these pumpkin bread bowls, but I swear the dutch oven is the next best thing to a real brick oven. If you don’t have a dutch oven you can just bake this on a cookie sheet, it stills works great, but you just don’t get that awesome crust and it may be a bit denser. I gotta say though, if you do not have a big old cast iron dutch oven, you should probably just go out and get one. I use mine all the time. It’s one of my favorite kitchen tools… and it’s pretty too!! Other than the little dutch oven thing, this bread is easy peasy, super simple and I promise you can make it. Do not be afraid of bread. Bread is a good thing, a very good, and typically very easy, thing to make. This recipe does require a preferment, but it’s just bread flour, water and yeast. Mix it together, let it sit overnight and then mix the final dough the next day. Super simple. It’s so healthy! 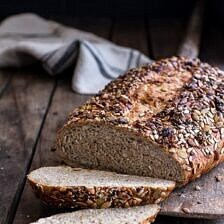 This Seeded Whole Grain Breakfast Bread is packed with whole wheat flour, oatmeal, ground flax and all kinds of seeds. 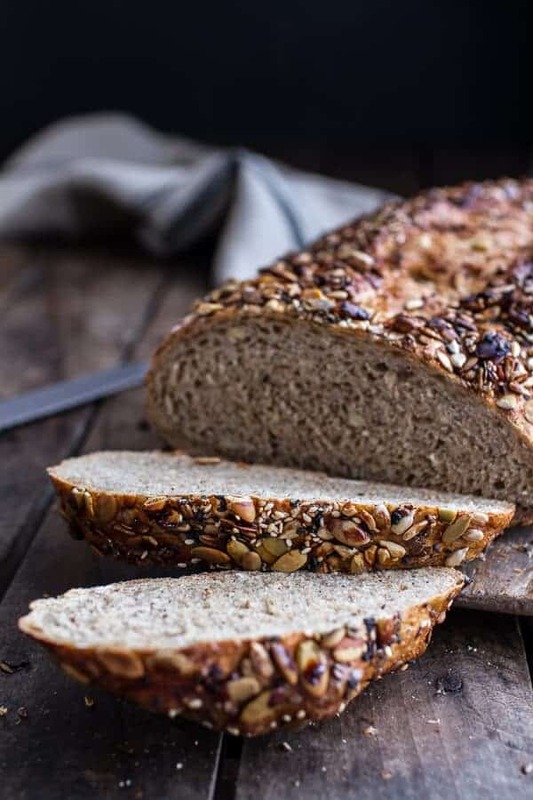 I used pumpkin seeds, sunflower seeds, flax seeds and black + white sesame seeds because I love them all, but feel free to use your favorite blends. But um, pumpkin seeds are my all time favorite, and probably the majority of the seeds I used here were pumpkin… so good. Do you see what I am talking about though?? I mean look at that crust – light and airy holes throughout! And that crust!! 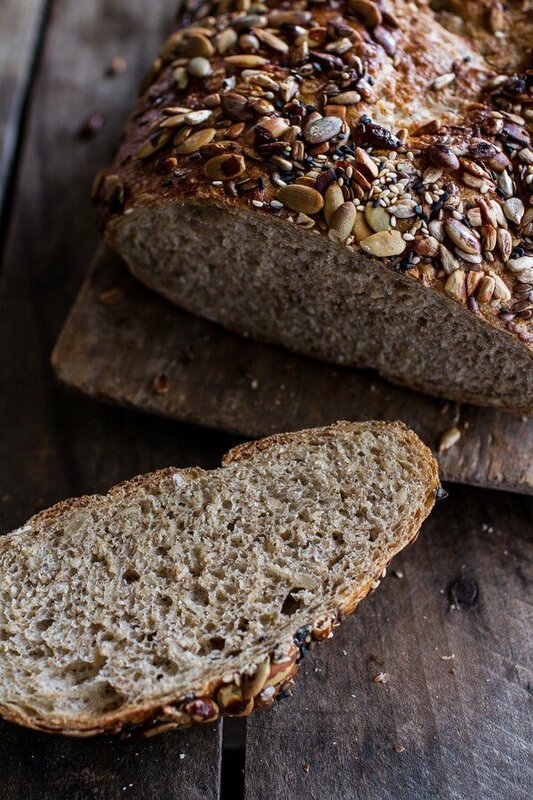 The seeds make this bread, so very good and toasty! It’s honestly the most perfect bread. Oh and are you a jam and toast person?? The night before baking the bread make the preferment. In the bowl of your stand mixer, mix together the flour, water and yeast until a smooth paste forms. Cover the bowl and allow the preferment to ripen at room temperature overnight. The preferment will double in size and become bubbly on top as it sits. The next day measure out 1/4 cup warm water in a glass measuring cup or bowl. Add the yeast and honey. Mix to combine and then allow the mixture to sit, undisturbed for 5 minutes or until the mixture is foamy on top and smells like bread. During the same time add the remaining 1 1/4 cups warm water to a bowl. Add the oats and ground flax. Allow this mixture to sit 5 minutes. After 5 minutes add both the yeast mixture and oats mixture to the bowl with the preferment from the night before. Add the whole wheat flour, bread flour and salt. Using the dough hook, mix the dough on medium speed for 4-6 minutes. If the dough seems extremely sticky, add 1-2 tablespoons flour. Now add in 3-4 tablespoons of the mixed seeds. mix until combined. Remove the dough from the bowl and knead with your hands on a floured surface for a minute or two. Grease the bowl you mixed the dough in and place the dough back in the bowl. Cover with plastic wrap and place in a warm area for 1 1/2 to 2 hours or until the dough has doubled in size. Once the dough has doubled in size, preheat to the oven 450 degrees F. Place a 5-quart, or larger, cast iron dutch oven with a tight fitting lid in the center of the rack. You may also use a baking stone, but I have found the the dutch oven with a lid works the best. Punch the dough down with your fist and then scoop it out onto a floured work surface. Knead the dough a few times with your hands and then form the dough into rough oval or circle shape (if needed, you can divided the dough in half and make two loafs). Place the dough on a parchment lined baking sheet and cover with a damp kitchen towel. Allow the dough to rise 20-30 minutes. After 20-30 minutes, brush the dough with the beaten egg and then sprinkle with the remaining mixed seeds. 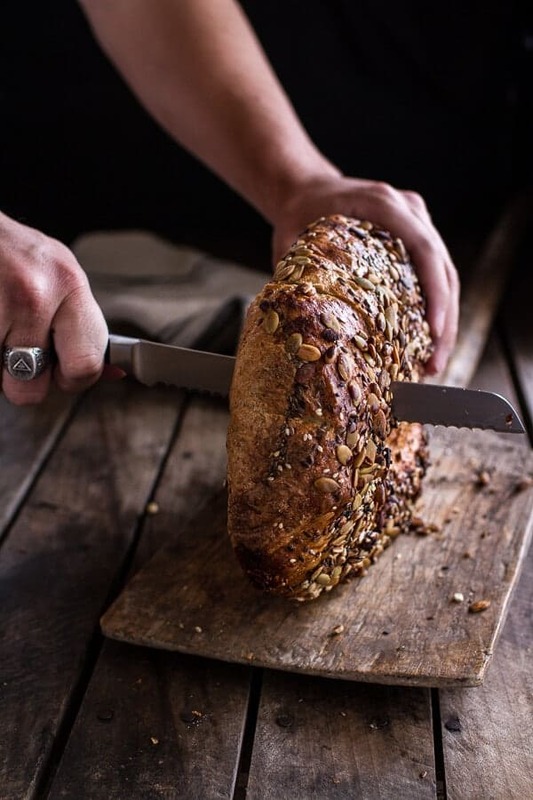 Using a sharp knife, gently make a small slit down the center of the loaf. Drizzle the the seeds with 1-2 teaspoons honey. When the dough is ready to bake, carefully remove the hot dutch oven from the oven using oven mitts and remove the lid. Very carefully, pick the dough up by the parchment paper and lift into the hot dutch oven. Using oven mitts, place the hot lid back on the pot and return to the oven. Bake for 20 minutes, then reduce the heat to 375 degrees F. Using oven mitts, remove the hot lid and continue baking until the bread is a deep, golden brown, about 15-20 minutes more. Remove from the oven. Using a thin handle of a spatula, carefully lift the bread out of the pot and place it on a rack to cool completely, about 2 hours. Don't slice into the bread right out of the oven, the bread continues to cook as it cools. *If you do not have stand mixer, you can knead the dough by hand on a flour surface. [Here is a great tutorial | http://allrecipes.com/video/36/how-to-knead-dough/detail.aspx] on how to knead dough. **If you do not have a dutch oven, the dough can just be baked on a cookie sheet. Just be aware that the cooking time may very slightly and you may not get the some crusty on the outside soft on the inside results. ***The dough can be divided in half for small loafs or to be frozen. Or a butter and toast person? I am all about the jam (or smashed avocado + jam), but the fam loves their sweet cream butter. OH MAN, I am a fiend for bread as well. Daily toast, no negotiating. 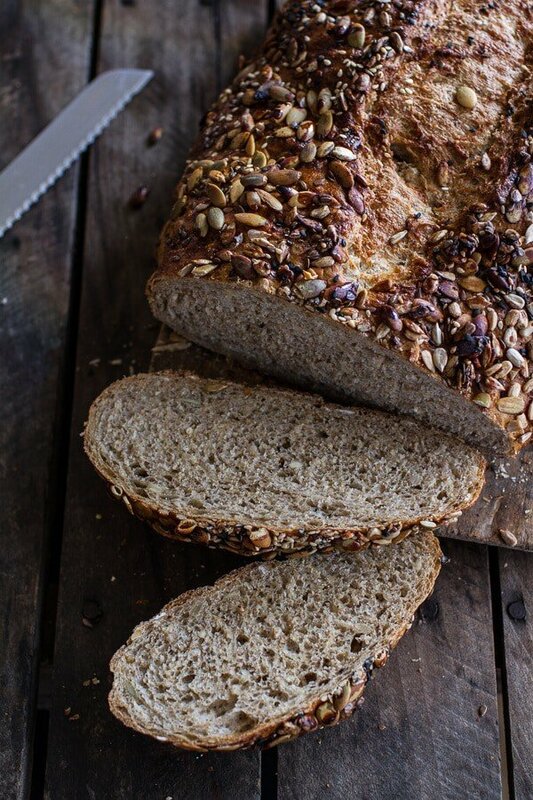 And this bread looks absolutely gorgeous, so grainy and hearty, and that crust! Killer. 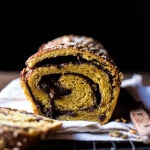 We are huge bread fans here as well and this looks amazingly delicious! I am in love with all of the toppings, yummy! YUMMY!! I wish I had a big slice with my coffee right now. 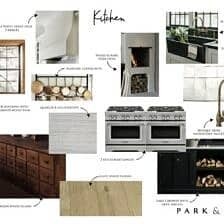 I love all of those seeds…it’s like an everything bagel….do you put the parchment paper in the dutch oven with the bread…or take the bread off of the paper first? Can’t wait to try.. I am such a bread fanatic, and this loaf looks perfect! Love all those seeds on the top!!! I HAVE to make this. I’ve been sad that summer is about to be over, but honestly, after seeing temperatures in the mid 90s all week, I can’t wait for sweater season! Haha! I love to bake bread in my dutch overn, comes out perfect every time. 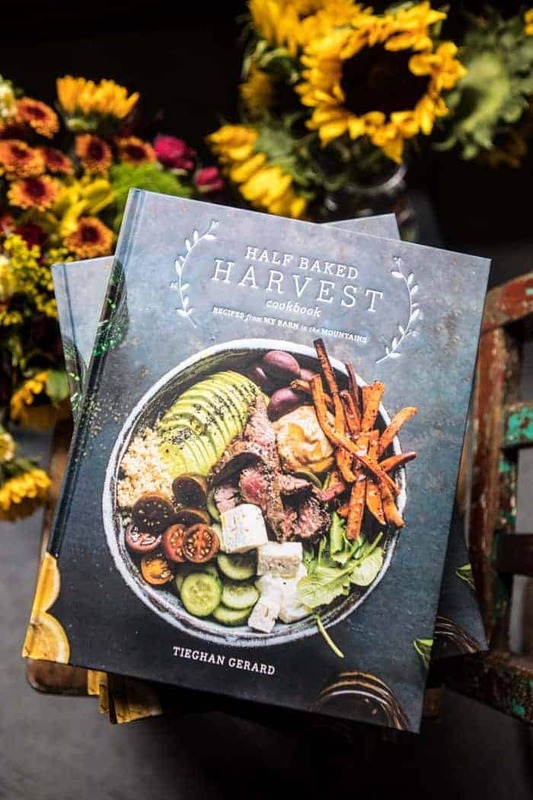 I can not wait to try this recipe Tieghan! Looks simply perfect, pinning! Thanks Kathy! Dutch oven bread is the best! I have 2 slices of cinnamon raisin toast up to 3 times a day, most days. So it’s safe to say I’m a bread person. I justify this by saying I’m carb-loading for a big workout. HA! Just a little butter and that’s all I need. 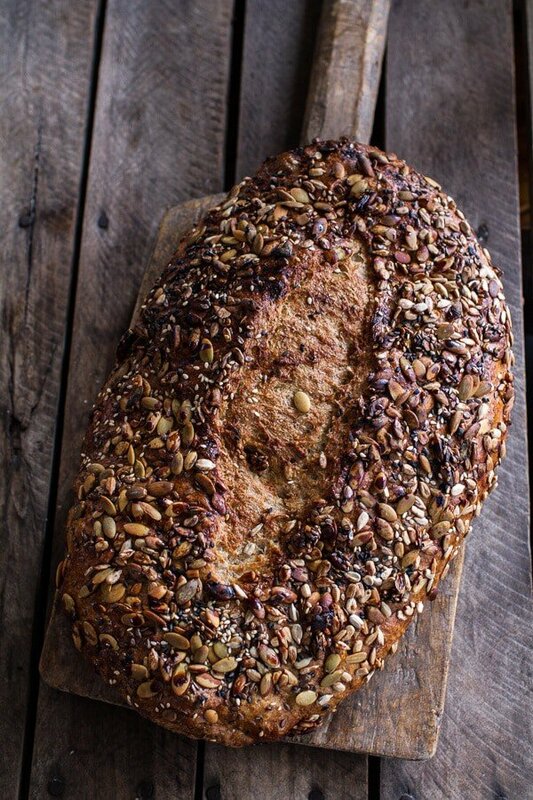 Homemade bread is amazing, and this one looks awesome with all the crunchy seeds on top. Thanks for sharing! Thanks Sarah! Gotta love the carbs! this is a beautiful loaf of bread! i was just craving something like this yesterday too! happy fall, tieghan!!! Stunning as always and reminds me of a bread I buy at Trader Joe’s! LOOOOVE it! I have not mastered bread, but I wanna try this recipe! I’m literally drooling. I love breads like this. I bet I’d eat the whole entire loaf! Love boats and sweater season the most too! Thanks Bri! I don’t eat bread but I would make an exception for a slice of this yummy, gorgeous looking loaf. Really amazing Tieghan! What a beautiful bread! September has seen me making bread too, so I completely understand. Love all the pumpkin seeds. I also made bread this weekend. It’s a perfect almost-fall activity. 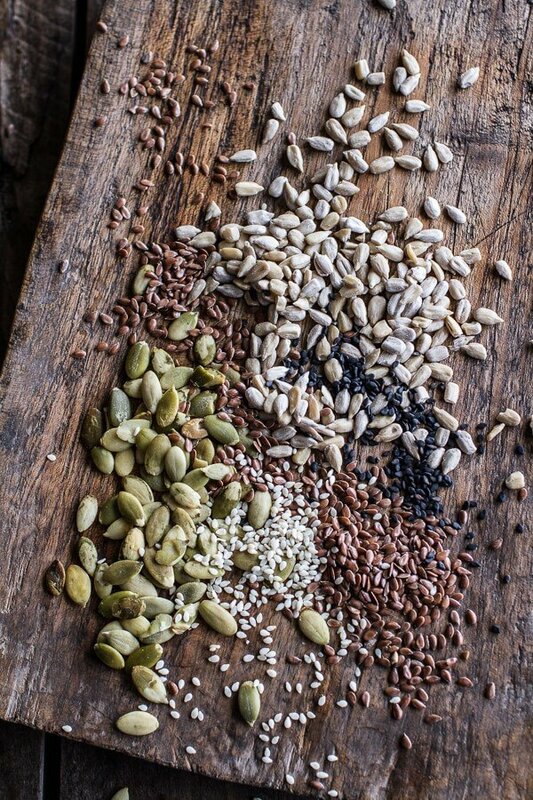 I’ll have to try this kind though – love all the seeds! Tieghan! This looks delicious! I have been searching for and collecting bread recipes. Thank you so much for this! Feel free to add more! Thanks so much, Amber! Hope you are enjoying your week! Ahhhhh this looks so delicious!! All those grains and seeds!!! This looks great! 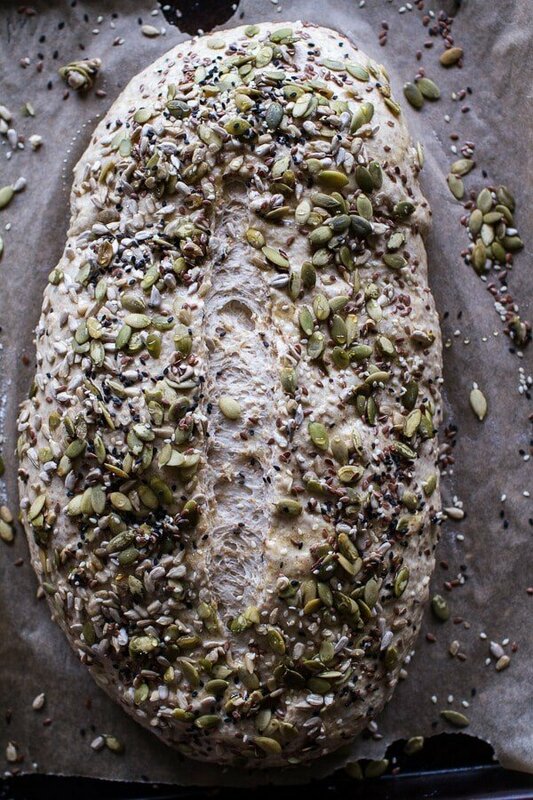 I’ve never thought of making a seed bread. Putting it on the to-do list! 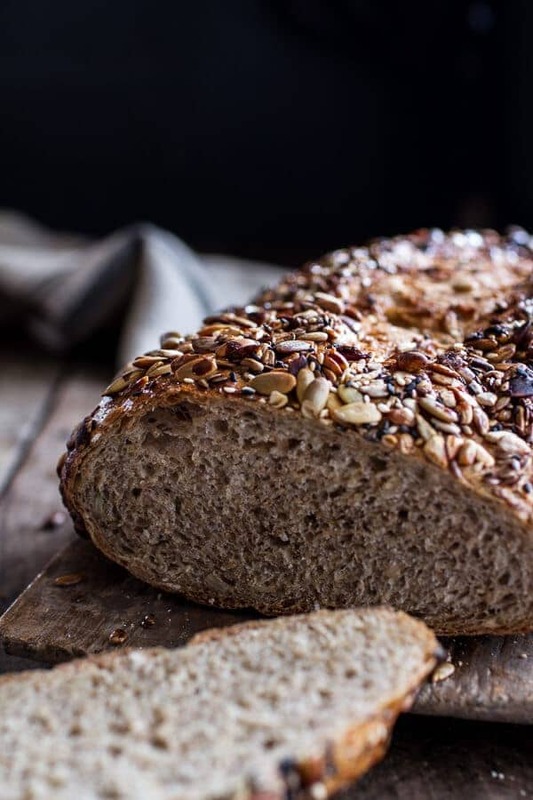 I don’t bake bread much, but this looks just to die for, perfect thick-cut table bread for the mornings! OMG your bread looks AMAZING!!! Me and the hubby love bread, especially homemade. Question……is your Dutch oven plain or enameled coated??? I’m guessing coated. Can’t wait for the cooler weather. Been a lovely summer and all of a sudden, 92 degree heat. Did you even have summer ???. Seems like you were talking about snow in May/June and cool weather now……Best wishes! Yup, coated. And no, basically no summer here. Ha! Warm bread out of the oven with butter, cinnamon, and sugar–that is how I remember it but I can’t do that now. I do still roll up the left over pie crust with butter, cinnamon, and sugar–you can’t give everything up–LOL. Cinnamon sugar is the best! So good! You should be daaaaaang proud of this bread! It’s gorgeous! Awe, thank you so much!! You are the best, Katrina! 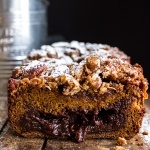 I love whole grain breads, this is one stunning loaf! 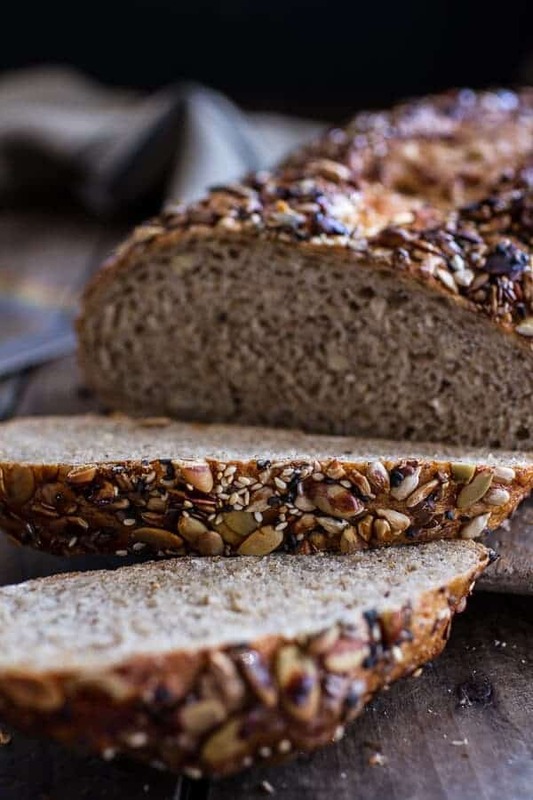 Whole grain breads are the best, they always taste good! This bread looks amazing! It practically looks like a full meal all by itself, with all those beautiful seeds. Yay! This looks so incredibly tasty! I can only imagine the perfect crunch that the seeds add to the chewy bread. Officially drooling over every. single. photo. of this bread. OHMYYUM. THANK YOU! Hope you are having a great week, Stephanie! This looks delicious and healthy! I am definitely trying. Baking bread always seem super intimidating. You make this recipe seem pretty approachable though, so I’m hoping to try it out. Plus, freshly baked bread on a fall weekend morning? Perfection. 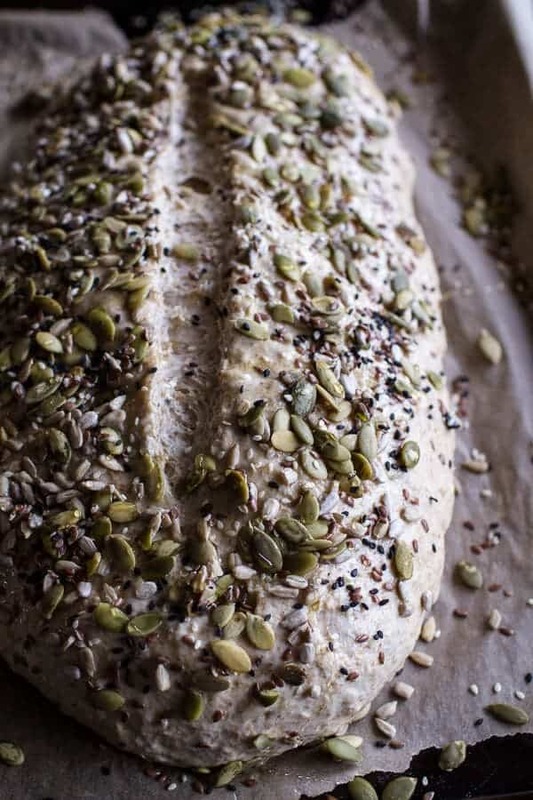 This seeded loaf is calling my name! LOVE crusty and seedy bread! Wonderful pics.. is it natural light ? i have been on a major bread craze lately. 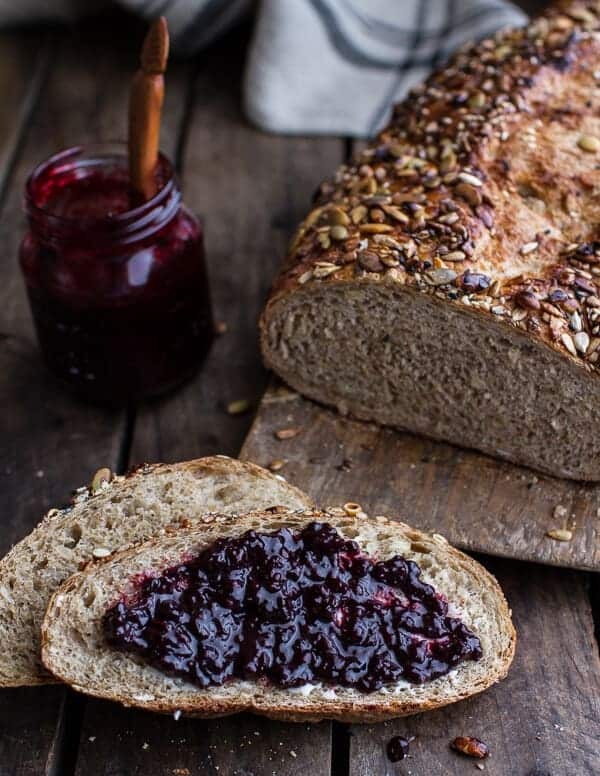 this weekend i made mark bittmans no knead bread..i will definitely have to give this one a try, lovely pictures as always and such hearty bread. Oh I have heard so goood things about that bread!! I grew up on freshly baked bread so this brings back bunch of memories! I love all the nuts/seeds that you added. Tieghan, perfect recipe just in time. I actually was “growing” — not sure the correct term the starter for rye European bread.. but i ran out of rye flour and made yours instead. I was very surprised how hardy it was, not your typical yeast light fluffy bread, just what i wanted! It’s really good, we are have been eating it with homemade eggplant caviar, and sandwiches. Hubby gave it 2 thumbs up. Definitely baking it again. Tieghan!!!! What a fantastic recipe! I made this bread on Sunday and it is AMAZING. I can’t stop nibbling at it all day long. The seeds on the top really give it a nice crunch. One thing though, I had to adjust the amount of flour. I needed to add way more than 2 tablespoons (like almost a cup) to make sure the dough wasn’t sticky. Regardless, amazing amazing recipe. Thank you!! SO happy you love this recipe!! THANK YOU! As for the stickiness, it is very dry in my area, so that might have something to do with it. Also, the dough is men’t to be on the sticky side. Glad it worked out for you! I love this bread absolutely great !! 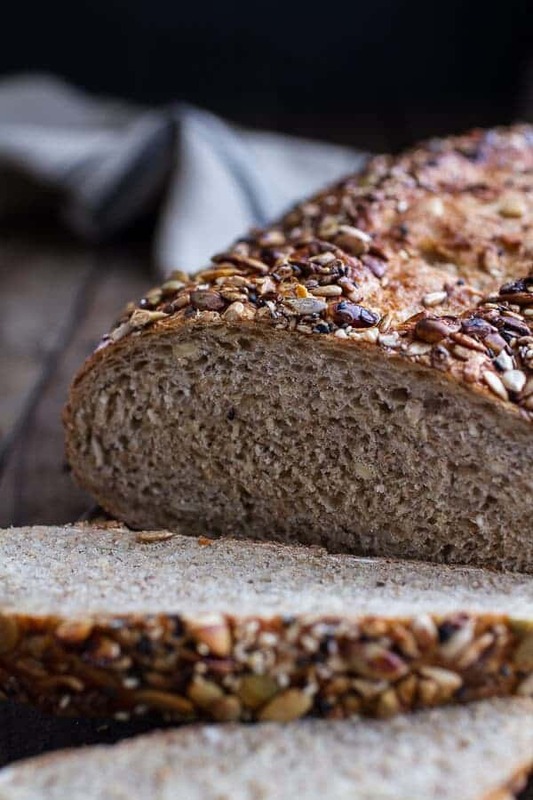 I have been looking for a whole wheat bread that is soft and actually good. It came out perfect. I did have to add more flour for it not to be sticky but other than that perfect. I was wondering though, you mentioned freezing did you freeze the extra dough or the bread? I like to freeze the bread baked + sliced, but the dough can also be frozen. Just thaw it overnight in the fridge and then bake as directed. I made this bread yesterday and I am pretty impressed. It was very good! My father is baker so I am a pretty tough critic. 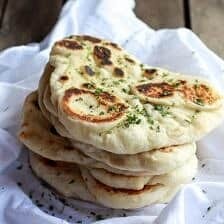 This is one of the best bread recipes I found online. Bravo! AWESOME!! I am so excited you loved this, thank you! 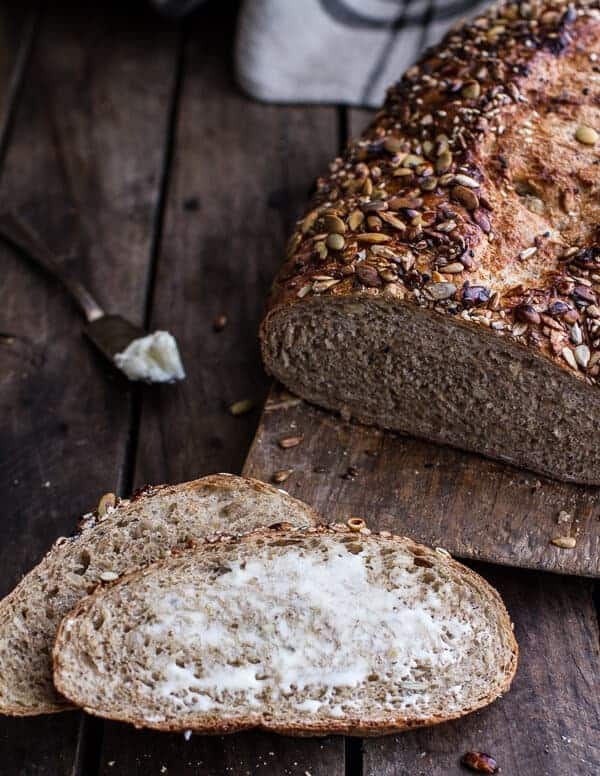 I’m new to bread and this looks amazing.. i was going to make mini bread& butter as gifts this year. in your expert opinion, do you think this could work in mini loaf pans – or would it lose its amazingness?? Hey Amy!! I think that would work, but you probably will not get the super crusty crust. It will sill be delicious though. Hope everyone loves these! I just made this bread today and it came out beautifully, just like your pictures. I had to add a bit more flour to get it to the right consistency, but NBD. I agree that baking it in a dutch oven makes a perfect crust- really comes out like an artisan bread. Lovely recipe; I will make it many times. Thank you. Hi! 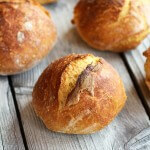 Love the recipe, can it be used to make rolls (buns) instead of a loaf? Would that help the rising etc? This bread is amazing! I can’t stop eating it. This is the first time I’ve made bread that actually worked. Thanks for sharing the recipe with us. I was wondering if I don’t use flaxseed, do I need to add an extra egg to the dough? Does the flaxseed act as a flax-egg? Or can I just leave it out? You can just leave it out, no big deal. Hope you love the bread! Making this bread currently, however, my preferment looks more like a dough than a paste. Do I need to add less flour? I know I’m a little late to the game but…wow! Those pictures are stunning, the recipe was easy to follow and holy crap that bread! That was insanely amazing bread! I have my preferment going for a second batch in two days. Seriously delicious! Thank you so much! THANK YOU! Have the best New Years! This looks delicious and I really want to try it out. Do I put the parchment paper into the Dutch oven with the dough on it and bake? Thank Annie! Yes, put the parchment paper in the oven. Hope you love the bread! Happy 2016! Just took my first bite … What a beautiful loaf of bread … I forgot the honey on top but it’s still excellent !!! Thanks!! Hi! 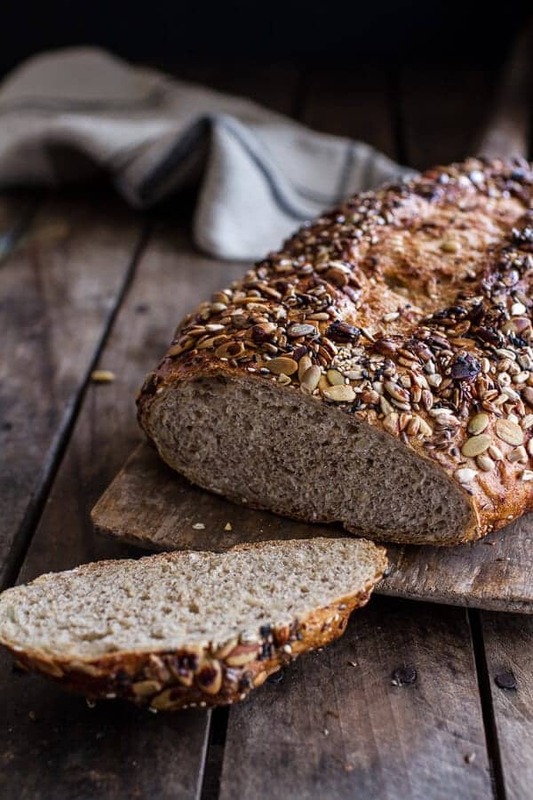 I have never baked bread before but cannot wait to try this recipe! I don’t have a dutch oven, but I do have a loaf pan.. could I bake this bread in that, or would you recommend sticking to the cookie sheet? Yes, a bread pan will be fine. Hope you love the bread and let me know if you have anymore questions. Thanks! Just made this and had first slice. OMGosh this is amazing bread! TY so much!! Ah So happy you liked it!! Unfortunately I do not recommend substituting the WW flour four wheat berries. I am not sure the bread will bake up that same. Please let me know if you have questions, THANKS! ? Could this be made by substituting 1 cup of wheat berries for 1 cup of the ww flour? When I am stressed I love to bake and my new passion is baking breads. Your recipe is best. The bread came out beautiful. My teenage boys gobbled the bread. They want me to bake this bread at least two times a week. Thank you for the recipe. This is a keeper. Very good Webpage, Carry on the excellent job. thnx!. 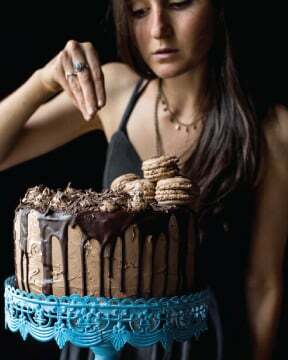 I am making this today! It looks amazing. I was just wondering if the whole wheat flour is just plain or does it have to be bread flour? I also just finished the preferment and it will only be sitting for 6 hours before I start mixing, is that okay? Hey Renee!! Plain flour will be fine. 6 hours will be fine as well. Let me know if you have other questions. Hope the bread is a hit. Thank you! ? The bread was definitely a hit! I’ve made it more than a few times now. I have not made bread in years, so I was wondering if I can use quick rise yeast in the preferment and if so, how long do I let it ripen? Hi! Yes, you can use quick rise yeast. No need to proof it. Just continue on with the recipe as directed. Let me know if you have questions. Thank you and I hope you love this! Looks amazing! I’m just started in the homemade bread world ♡ but can i use only whole wheat flour instead bread flour? HI! You can either whole wheat flour or regular all-purpose flour, whatever you prefer. Let me know if you have other questions. Thanks! Made this bread many times for my family and for a friend and it was awesome, thanks for the recipe,all loved it. That is so awesome! Thank you Azza! I’m so glad I found this recipe! I’ve become a bread snob and just can’t get myself to buy anything in the processed bread aisle anymore. This looks EXACTLY like what I was searching for (thanks Pinterest!) I can’t wait to make/bake it! YAY so happy you found it too! I hope you love it! Thank you! I made this today! So fabulous, my husband is already obsessed wit it. Awh I am so happy you and your husband love this! Thank you Angela! Sounds amazing! I am so glad this turned out great for you Sydney! This bread is perfect. I’ve began to bake it weekly–I divvy it up into two smaller loaves, baked side-by-side in the dutch oven, but easily broken apart–and then I slice it, freeze it, and it’s toast for me and my SO all week long. We love it with curried avocado, and peanut butter. I’ve also seen my boyfriend slather hummus on it for breakfast. So versatile, delicious, and easy! I’ve memorized the recipe, and I’ll use it forever. Thanks!!! I am so glad you are both enjoying this bread! Thank you Alyssa! This is hands down the best nutty whole wheat bread I have ever made! Just pulled the third loaf in the past year out of the oven, and it smells and looks just as good as it did the two previous times. BLT’s tonight on this beautiful bread. That is so amazing! Thank you Kerry, I am so glad you love this bread! Wow, this bread was delicious! It was very easy to knead, produced a beautiful shape, and was nice and crusty. i accidentally put all the seeds in the dough, so i omitted the egg wash and topping with more seeds, it still came out yummy. Will make again next weekend and follow instructions more closely! Hi Judy! I only provide the measurements that I use, but I will look into adding the weights. Thank you! This recipe is great!!! 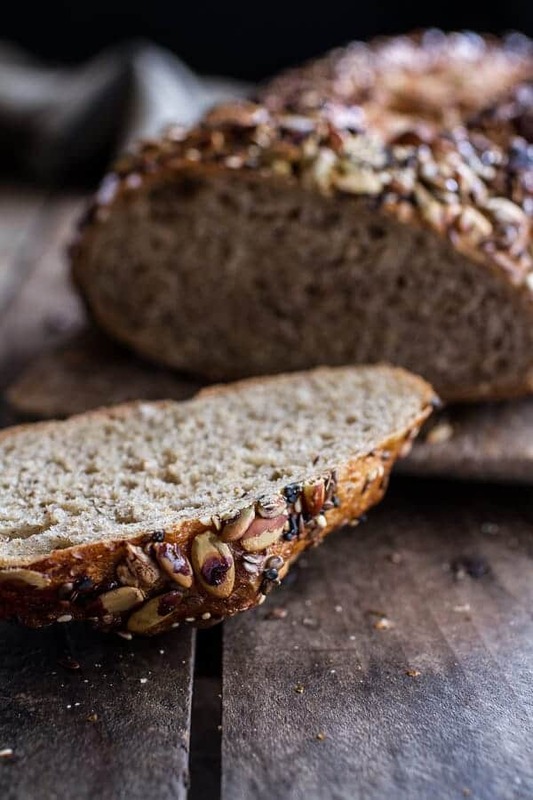 I just made it and am in love with this bread – i’s super easy to make and tastes amazing. I actually made 2 batches, one where I baked it in a Dutch oven and one where I baked it on a baking sheet. They both tasted great and had a nice crust / crunch to them; however, the one on the baking sheet did burn slightly in a couple of places (nothing too much though). All that to say, if you have a Dutch oven you should use it! This is exactly what I was looking for in terms of taste and texture. Incredible fresh, and excellent toasted with butter the next day. (I usually slice bread the day it’s baked, and keep half in the freezer.) I had neither bread flour, nor whole wheat white flour, and could only find both around me in huge quantities. So, I used mostly all purpose white flour, with 1C of whole wheat flour, which I think worked wonderfully. I mixed 3/4 of the seeds into the loaf, and saved a lesser amount for the top. I also used more seeds (pumpkin, sunflower, sesame & poppy), than the recipe called for, since I mixed a bunch into the loaf, but didn’t measure. I was also reminded that the amount of yeast required for this, two and a quarter teaspoons, is the amount that comes in a typical envelope of yeast. I’m trying to figure out how I can fit making this into my life on a regular basis! This looks amazing! Could you tell me what brand/size of cast iron dutch oven you used exactly to make this bread? 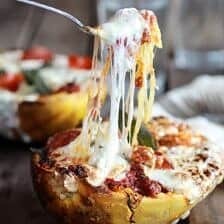 I want to make this, it’s so delicious looking. 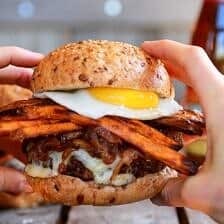 Adorei seu site ótimas receitas e o site é muito bonito! Ótimo trabalho para a equipe!!! amazing! the perfect breakfast bread!